The center of our galaxy is a frenzy of activity. A behemoth black hole—4 million times as massive as the sun—blasts out energy as it chows down on interstellar detritus while neighboring stars burst to life and subsequently explode. Now, an international team of astronomers has discovered two exhaust channels—dubbed "galactic center chimneys"—that appear to funnel matter and energy away from the cosmic fireworks in the Milky Way's center, about 28,000 light-years from Earth. All galaxies are giant star-forming factories, but their productivity can vary widely—from one galaxy to the next and even over the course of each galaxy's lifetime. One mechanism for throttling the rate of star production is the fountain of matter and energy whipped up by the heavyweight black hole that lurks at a galaxy's center. "Star formation determines the character of a galaxy," Morris said. "And that's something we care about because stars produce the heavy elements out of which planets—and life—are made." In images they collected from 2016 to 2018 and in 2012, the researchers found two plumes of X-rays—the galactic center chimneys—stretching in opposite directions from the central hub of the galaxy. 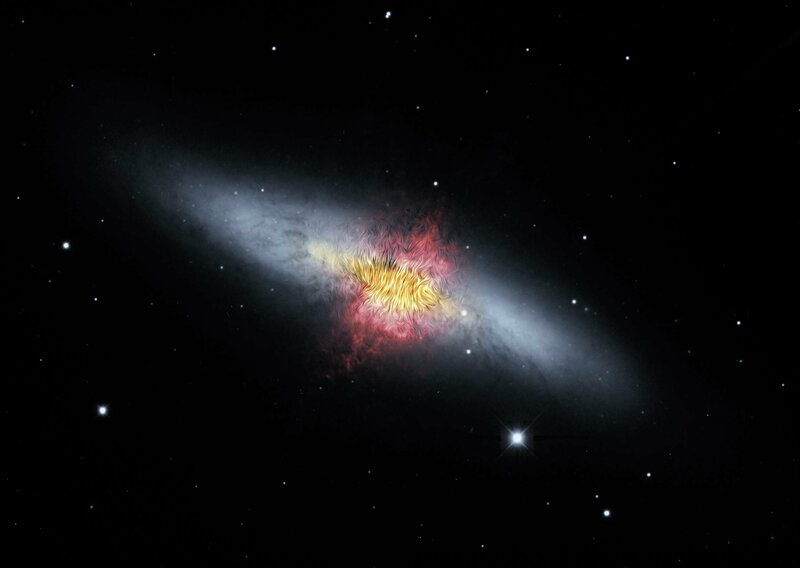 Each plume originates within about 160 light-years of the supermassive black hole and spans over 500 light-years. Our galaxy isn't quite that extreme—other galaxies have fountains powered by central black holes weighing a thousand times more than ours—but the Milky Way's center provides an up-close look at what might be happening in galaxies that are more energetic. "We know that outflows and winds of material and energy emanating from a galaxy are crucial in sculpting and altering that galaxy's shape over time—they're key players in how galaxies, and other structures, form and evolve throughout the cosmos," said lead author Gabriele Ponti of the Max Planck Institute for Extraterrestrial Physics in Garching, Germany. "Luckily, our galaxy gives us a nearby laboratory to explore this in detail, and probe how material flows out into the space around us." 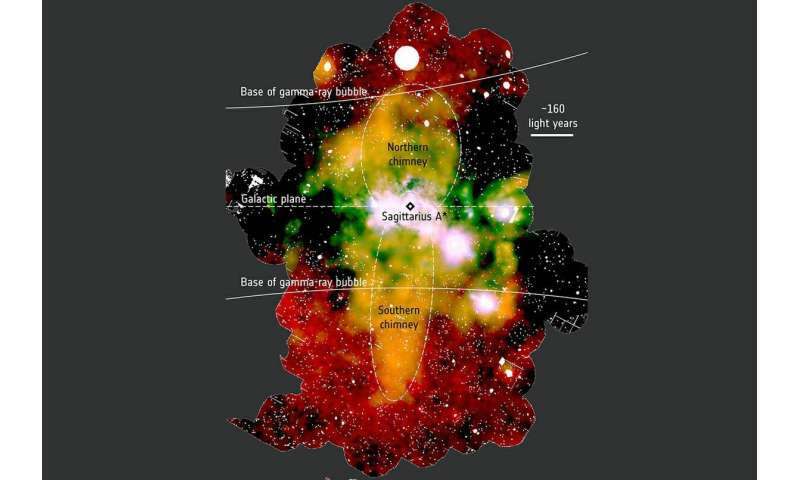 ... "galactic center chimneys"—that appear to funnel matter and energy away from the cosmic fireworks in the Milky Way's center, about 28,000 light-years from Earth. At least you can't claim I am inconsistent! So basically instead of projecting X-rays and gamma rays in all directions, our black hole is sending them out along the galactic axes, preventing them from disturbing star formation. So we have a galaxy that doesn't destroy life before it can get started. These "galactic center chimneys" (LOL) are plasma ignoramus speak for the Birkeland currents at the center of the galaxy. & Da Schneib had their turns, Now it's my turn into the scrum. Oh DaS, trifle bite of anthropomorphic there? It is obvious that this article was a clumsy rewrite of the original material. No need to belabor my opinions on that. With more sophisticated technology we will find other, maybe similar, maybe a random range of Galaxies that are also manifesting the x-ray "chimneys" phenomena. Maybe even variations in high-powered radiation detected? Why not across the spectrum? From materials ejected from their accretion disks. Simple Newtonian Physics of "for every action there is an equal & opposite reaction. @rrwillsj, are you surprised to find humans in a galaxy that hasn't been subjected to X-ray and gamma radiation while we were evolving? Waiting our turn to be fried? The greatest possibility for sophont evolution is billions of years of inhabiting a quiescent galaxy. Yet what do we observe? Not looking good for even the most pessimistic interpretation of the Fermi Paradox. When you consider how active most large galaxies are? This early in the evolution of the Universe. I'm just going to stick with cynicism that there is a high probability that the Drunkard's Walk is about to step on us! Okay, I just read the abstract & there are obvious errors in the article posted to phys.oeg. I urge you to check it out for yourself. zThe most important mistake in the article posted here was to cl;aim the chimneys are projecting from the Galactic Center i.e. from the singularity. The abstract puts the exhales from near but around the Center Bubble. I opinionate that at least part of the energies of the chimneys are a result of accretion disk material in a cosmic furball of hooliganism. So what's your theory then? Birkeland currents pop out of free space and power galaxies? You never have a conclusion. Just claim everyone is a plasma ignoramus, yet you have no clue about Generalized Ohms Law in Plasmas, and no theory. Theory? old_coot, do you know the numerous definitions of theory? The multitude of constantly shifting meanings? Right now since you asked my favorite is my Theory of Stupid Design. That the Universe is dominated by stochastic processes. I also favor the efforts to create a verifiable Theory of Quantum Gravity. Even if it turns out totally useless. LAWS FOSSILIZING A WOOLOONEY BIZARRO UNIVERSE. Guess I'm an outlaw at heart. Cause I don't believe any of these categories defining reality will survive more then a trillion or so years before all the rules & regulations we invent, break down. Then, all that will be left? Will be vast, hyper-dense conglomerations of gravitons. All those piddling petty forces of EM/WN/SN/plasma/aether , all Matter & Energy will be long gone. Nothing to see here folks but Gravity. Implacable, enduring unweary Gravity. Cyclones become chimneys, ha, ha! With the increase of speed of rotation (including faster orbits of stars and changing the structure in the centers of galaxies) there is also the increase of intensity and quantity of radiation coming from the openings of a cyclone on the poles of a central structure of our galaxy.. The emissions of radiation are measured on the poles that are to 30.000 ly and more far from each other and that proves the existence of cyclones (cyclones and whirls on stars). Cyclones (the eye of a cyclone) are the places of occurrence for all occurrences that have ever been measured (radiation emissions, star formations, etc.). They are formed due to the rotation of an object – and galaxies, especially their centers, rotate. Just claim everyone is a plasma ignoramus, yet you have no clue about Generalized Ohms Law in Plasmas, and no theory. You are clearly a plasma ignoramus given your repeated claims that electric currents cannot flow through space, in direct conflict with observation. And yes, there is a theory and your willful ignorance doesn't change that fact. "We are finally understanding due tov direct observation that electric currents drive these processes and it is high time we get around to describing this system properly using real plasma physics. BTW, the z-pinch is clearly pointed out in the image above. Fool. I never said currents don't flow in space. You pretend they are the cause of everything, not an effect. What I observe in these comments, is that many people conflate "Similar" with "Identical" "Interchangeable" "equivalent". A b-day party helium balloon is "Similar" to a Navy patrol helium blimp. But they are not "equivalent". Though, since they both use the same gas for lift? you could make an argument for "interchangeable". Yeah, that's how wickedly perverse my sense of humor is. Cause I'd go for that Duff Beer gusto just to annoy my debating opponent. A star is "similar" to a planet. In that both consist of Matter. Even if the star is a trifle excessively energetic. But obviously not "identical". Even though both star & planet consist of "identical" elements. Each Human Being is "equivalent" of every other Human Being. Even if not "interchangeable" nor "identical"
However, they are "similar" in that they are conceived, born, live & die. Nope, another lie. Why do you comment on things that you clearly have no grasp of? "Evidence has mounted in recent decades that outflows of matter and energy from the central few parsecs of our Galaxy have shaped the observed structure of the Milky Way on a variety of larger scale." Outflows of plasma equals electric currents, which carries energy (electrical), as they state. And just as Peratt has modeled, those electric currents do shape the observed structure of the Milky Way. This is one of your most obvious misconceptions. If the plasma is quasi-neutral, like most plasma (see https://www.plasm...rality), there is NO net current and therefore no induced magnetic field. sorry cant but there is an old engineering rule that covers the subject of all particulate matter. You have to PULL water. pushing it around the tub as you utter chirps of glee. then you assume that the rest of the universe operates the same. You just lack the capacity to understand the scale of reality. If the plasma is quasi-neutral, like most plasma, there is NO net current and therefore no induced magnetic field. There are many misconceptions regarding plasma, that quasi-neutrality means there is no currents is one of them. "While all matter is subject to gravitational forces, the positively charged nuclei, or ions, and the negatively charged electrons react strongly to electromagnetic forces, as formulated by James Clerk Maxwell (1831-1879) and Hendrik Antoon Lorentz (1853-1928). because of this strong interaction with electromagnetism, plasmas display a compexity in structure that far exceeds that found in matter in the gaseous, liquid, or solid states. In addition to the cellular structure, most visible to us on the Sun, plasmas most often display a filamentary structure...."
"...This structure drives from the fact that plasma, becaue ot its free electrons, is an excellent conductor of electricity, far exceeding the conducting properties of metals such as copper or gold.... Wherever charged particles flow in a neutralizing medium, such as free electrons in a background of ions, the charged particle flow or current produces a ring of magnetic field around the current, pinching the plasma into multi-filamentary strands of conduction currents." The charges don't "cancel out", this isn't an equation on a chalkboard. Yes because obviously the barycenter is producing magic energy from jebus. Yes they do, over the order of the Debye sphere, as any plasma physicist would tell you. Without bothering to look at the densities implied in these outflows, I don't know what that is in this case. However, it won't be far. Yet again, you are making things up despite being totally incompetent in the subject area. "the charged particle flow or current produces a ring of magnetic field around the current, pinching the plasma into multi-filamentary strands of conduction currents." No it doesn't. You are making things up again. Stop lying. The level of ignorance regarding plasma physics among astrophysicists is astounding, jonesdumb level of ignorance. Chimneys, exhaust vents...These plasma ignoramuses are playing with their rubber duckies pretending they have a clue trying to relate these plasma processes with what they can see from their mom's basement. Ooh, Billy, doesn't that look like mommy and daddy's chimney, and that one looks like Uncle Bob's exhaust vents... Pathetic! Pathetic creature. You know nothing about plasma physics, and are therefore in no position to comment on it, you clueless poser. oh cant, really? you cant control your self long enough to hold even a single rational thought? Those "structures" you are enamored with are NOT real. No, truly, those plasmastaticelectrippingaethrwoo "structures" do not exist. What you are imagining you are envisioning are particles & photons getting haplessly pulled everywhichway by a myriad of nearby Gravitational Attractors. Similar, NOT equivalent, to standing on a street corner when a large truck passes by at a good speed. Suddenly sucking up all the leaves & trash around you & Pulling it about you. "Hey!" You yell. Upset because you just had the suit your wearing dry-cleaned! Out here in reality, where "Push" , all the different forms of "Push" are very weak when compared to the remorseless, never runs out of fuel, never stops or turns off, unflagging "Pull". So you would rather ignore observation and continue along with your erroneous beliefs, sounds kinda religiousy. There you go with your rubber duckies applying your own ill-conceived beliefs. "...because of this strong interaction with electromagnetism, plasmas display a compexity in structure that far exceeds that found in matter in the gaseous, liquid, or solid states." It's nothing like your truckie, this is plasma. Your claims are misdirected and should be directed at you. Stop quoting from your sacred texts. It is irrelevant here. They are not currents, and nobody is claiming that they are. So this isn't plasma? That is what the "scared text" is describing, plasma behaviour. The currents are a natural occurrence of all inhomogeneous plasmas, as is stated. I quote this information due to the pervasive ignorance of plasma, shared by the astrophysicists and posters alike. Stop talking crap. That is a very vague statement, and says nothing about currents. What is forming them? How are they being sustained? What is the evidence for them? What are they supposed to be doing? In scientific, please, not pseudoscience word salad. Equations, mechanisms, EMF, observations, outcome. Get on with it. While preaching that BH_SO do not exist, because those are invisible. Now you are asking him to describe invisible magical mechanics of spazzplasmics? Man! his ouiija board is going to melt down doing those calculations! That is a very vague statement, and says nothing about currents. I guess the words "conduction currents" is a bit complex for you. Words are difficult for you, aren't they? "the positively charged nuclei, or ions, and the negatively charged electrons react strongly to electromagnetic forces...the charged particle flow or current produces a ring of magnetic field around the current, pinching the plasma into multi-filamentary strands..."
How are they being sustained? Ions and electrons flowing due to reacting strongly to electromagnetic forces. What is the evidence for them? The filaments, cells, and radiation among others. An ever ongoing process to maintain quasi-neutrality in a sea of inhomogeneous plasmas. ^^^^So, another non-answer. No mechanism, no evidence, no observation. You keep making stuff up. Stop it. You haven't got a clue about the subject. Who has written this up? That every moving plasma is a giant current? Show me, or shut up. You really are clueless. So, another non-answer. No mechanism, no evidence, no observation. Right, words are just a bit too much for your brain cell. Word salad is the phrase you are looking for. You don't understand the first thing about the subject, and have almost certainly not read the paper. You have never studied plasma physics, and have never published on it, or anything else. You are a clueless layman on a comments section. You believe Earth used to orbit Saturn! You are a scientifically illiterate clown. Why would anybody listen to any of your cultish rubbish? Why would anybody listen to any of your cultish rubbish? For the same reason you feel compelled to stalk me and respond with comments in the attempt to obfuscate the true nature of plasma. You are scared to admit your gravity only Einsteinian pseudoscientific maths claptrap is dead and Electric and Plasma Cosmology is the future of the space sciences. Hahahahahahahahaha! Lol. How long has that unscientific, Veilkovskian crap been going? Over 2 decades? Accomplishments? Zero. Impact? Zero. Valid science produced? Zero. Number of plasma/ astrophysicists on board? Zero. Failures? Too many to mention. Lol. Paranoid, much? I'll post in response to any pseudo/ anti-science trolls spewing BS. You just happen to spew more than most. Except Benni, and I hardly avoid him, eh? Oh, Castrogiovanni, you are just too polite, too courteous to benni & cant & the rest of the clown car of looneytick woofakirs that infest the phys.org forum. These vermin scum, partners of child-killing antivaxxers & the denialist cheerleaders for greed driven anti-science cultists. Deserve no more than the back of your hand. Whip it out & piss on the useless prats. & the executive committees for the RNC & NRA. Video stars being pissed on by Moscow whores. as they hoot & holler pointing & laughing at the videos of the weewillies dribbling on themselves as the Moscow whores spray trumpeneella's face. Now see Castro? This is how you deal with the altright fairytails. Splattering them right back with their own venomous methods. They are Buffoon after all. jonesdumb has shown his true colors, he got himself banned due to his unrepentant vulgarity. Saying he is too polite is a joke. well buffoon-who-cant, the jokes are on you & yes, we are all laughing & jeering your displays of ignorance. A joke for your self-awareness. Of the psychic medium who used an old camera to take photos of ghosts at her seances. The antique started to fall apart, & she takes it to a camera shop for repair. A few weeks later after taking the repaired camera home? She returns, complaining that the camera had been ruined by the repairman. He listens to her tirade until he realizes what she was actually complaining about. He takes the camera into the back. Where he sticks a needle into the cloth folding mechanism, poking tiny holes in it. He returns the "adjusted" camera to her. Promising the adjustment will allow her to photograph spirits again. After using it at her next seance? She returned to his shop to gush how marvelous the camera was working. helps you "see" "conduction currents"?